This careful analysis of a millennium of Christian art outlines the path by which Christians reinterpreted the Hebrew Scriptures to prove they foretold the ascendancy of Christianity. Starting with a solid introduction to the origins of Christianity and the beginnings of Christian art in the catacombs of Rome, Claman skillfully demonstrates the development of the anti-Jewish message of Christian art. 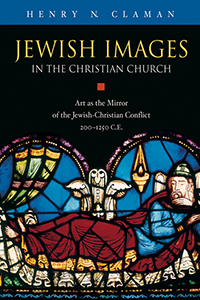 The study culminates with analyses of the majestic cathedral at Chartres, the public burning of the Talmud in Paris in 1248, and the expulsion of the Jews from France and England. With the third century frescoes in the catacombs of Rome, public art began to illustrate the doctrine of supersessionism. Christian marble sarcophagi, church mosaics, and statues, and brilliant Gothic stained glass showed how Christianity completely reinterpreted the Old Testament to indicate that it predicted and validated Christianity.